Today I visited the same places as yesterday, as well as some other sites. 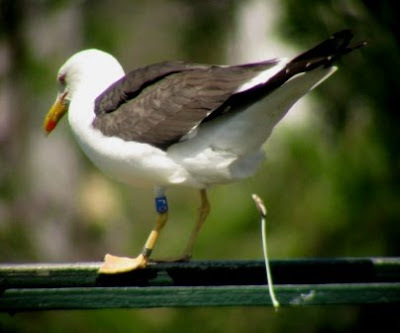 3 rings could be read, one of them was a 2nd cal LBBG, ringed in the colony of Zeebrugge last year! Very nice to see such a bird, my first immature LBBG in Gent from this project. The other ones were blue ones from RJ Buijs, again including 1 new ring (the other one was blue HF, a regular bird in Gent this spring). Frustrating was the presence of a pair of Mediterranean gulls, one of them wearing a white ring, but they stood just too far away to read the ring. Two more MedGulls were seen flying south, they seem to be leaving their breeding grounds now. 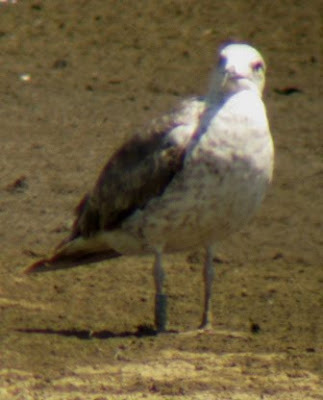 LBBG blue 0J (RJ Buijs), new bird to me, and only the second observation of this bird, the previous one being in October 2008 in Cádiz, Spain. A very bad picture of LBBG blue LSA.A (E Stienen), my first immature LBBG of this project in Gent!